"Selfie sticks, also known as selfie poles, have begun to flood the market," inventor Wayne Fromm says. "However, the popularity of the selfie stick can be traced to the extreme sports community - mostly Go-Pro users - who wanted to get a greater scope into their images at better resolutions. The Quik Pod enabled them to do that." LOS ANGELES, Calif., Oct. 30, 2014 (SEND2PRESS NEWSWIRE) — When Wayne Fromm invented the Quik Pod® (U.S. patent #7,684,694), the original selfie stick, more than 10 years ago, he had no idea how popular selfies would become. In fact, according to an article in Psychology Today, selfies have redefined how we document experiences. Selfies build relationships because they provide a powerful sense of intimacy through the authenticity that comes from the ownership of the lens by the subject. Selfies are about “being there” and sharing the moment. Not all selfie sticks are created equal. The original Quik Pod brand of selfie sticks is designed for strength, durability, inclement weather conditions, saltwater and to not rattle or shake. There are now a large number of low quality poles in the market that copy the look of the original but are grossly inferior. “No one wants their camera to end up at the bottom of the ocean,” Fromm says. Imagine the amazing holiday selfies families and friends could take? Quik Pod selfie sticks can be used with all types of cameras from smartphones, point and shoot and mirrorless cameras to all action, DSLR and GoPro. 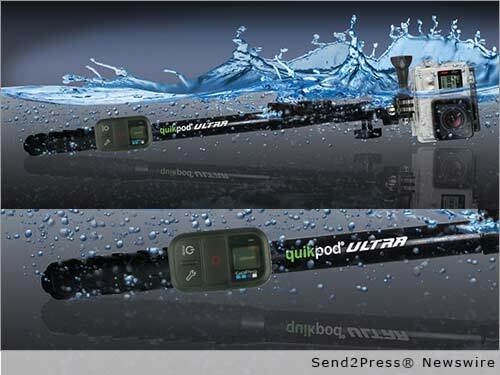 The Quik Pod ULTRA converts from handheld selfie stick to a tripod or ground supported monopod. Prices start at $19.99. * Understand the scope of your image. The further the Quik Pod is extended, the broader the image’s background will be. Think about whether emotion or surroundings are the capture focus. For more information on the original selfie stick, visit: http://www.QuikPod.com/ – or follow them on Twitter at: https://twitter.com/quikpod. Available at B&H, Henrys Photo and Best Buy. – Photo 300dpi: Send2Press.com/wire/images/14-1030-Selfie-Stick-300dpi.jpg . Original Keywords: selfie stick, Quik Pod ULTRA Fromm Works, Inc. Los Angeles California LOS ANGELES, Calif.
REFERENCES: California Business News, selfie stick, Quik Pod ULTRA Fromm Works, Inc. Los Angeles California LOS ANGELES, Calif.